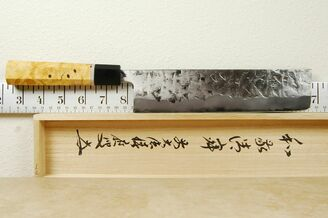 The Yoshimune White #1 Nakiri 210mm is a really well made knife featuring a unique and attractive stainless steel cladding. We are very excited to be able to offer these fine knives to our customers in the USA. The White #1 line of knives are constructed with an inner core of Hitachi White Paper #1 carbon steel. 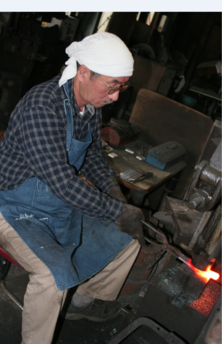 This alloy is also known as Shirogami No.1 or Shiroko No.1. It is a hard steel with a very fine granular structure. It has the highest carbon content of all the White steels which results in a blade that is the easiest to sharpen but can be the most brittle. 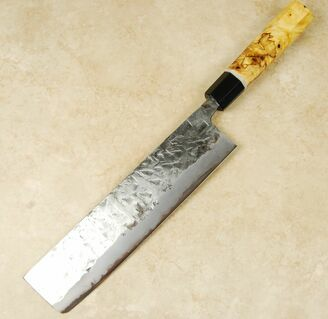 As it is a carbon steel it will discolor or corrode if not cared for properly. Of course this care is minimized by the addition of an outer layer of soft stainless steel. The cladding is finished in a really unique and attractive �pressed wood� finish. Nakiris are becoming more and more popular in western kitchens, often substituting for classic chef knives. It's like a mini vegetable cleaver that's easy to control and makes short work of most cutting tasks in the kitchen. It's a great knife for push cutters or choppers. The blade is mated to a beautiful custom octagonal handle. I'm a big fan of White #1 and have been looking for a small knife with some height that was low maintenance that could be used by non-knife nuts. My knife set is mostly guyto's (12). I wanted a knife with some weight, distal taper and cutting performance. Seemed like this knife fit my requirements.So I've had it about two weeks and used t to prep several meals. I am thoroughly satisfied with my purchase. The grind is very thin behind the edge but substantial enough to be able to rock chop. The mr Yoshimune has done an excellent job with the HT. 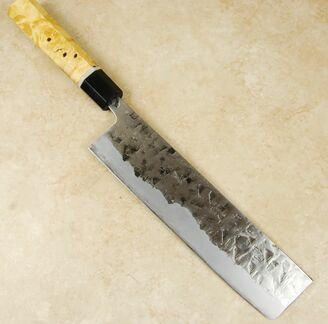 there isn't one visible chip or blade deformation and the it kept a keen edge through lots of basil and tomatoes.I don't have any other kuruchi knives and I sold my last Takeda Bunka several years ago. Never though I'd have another Ku Bunka but its a great knife. The Ku cladding is very artsy and stable. After polishing the stainless with Flitz, the KU didn't wipe off a bit and I was using a white cloth. He did a great at grinding the SS cladding back enough exporting the code White steel. My collection is very tight, Kato, Kono, DT, Shig... and I plan on keeping this Yoshi around for a while. I did have to sand paper the spine and choil but still haven't found the need to sharpen it. Its a very good knife at an excellent price. Prior to shipping, I had the knife fitted with CKTG's semi-custom Wenge & Maple handle; it's a lovely knife to hold and to behold! The balance is just right, it sharpened up quite nicely, indeed, and it's a pleasure to use. I've been slicing a bit of ham with it and the blade is already taking on an attractive patina. I wash it soon after each use and keep the blade covered with the same mineral oil I use on my cutting boards. Exemplary customer service!